Having clear skin is such an enormous blessing that is easily unappreciated or taken for granted, unless you have personally experienced serious skin problems. As a teenager, my skin was completely clear and basically problem-free. It looked great. However, as an adult, acne became a near permanent feature of my face. And along with this unwanted feature came two equally unwelcome companions, acne scars and discoloration. Fortunately the scarring has not been bad. But the aftermath of this adult acne combined with the strong Caribbean sun that I endure daily where I live have left noticeable discoloration and dark spots on my face. There is plenty of information available on how to get rid of skin discoloration. Likewise, there are many products that claim to do so. 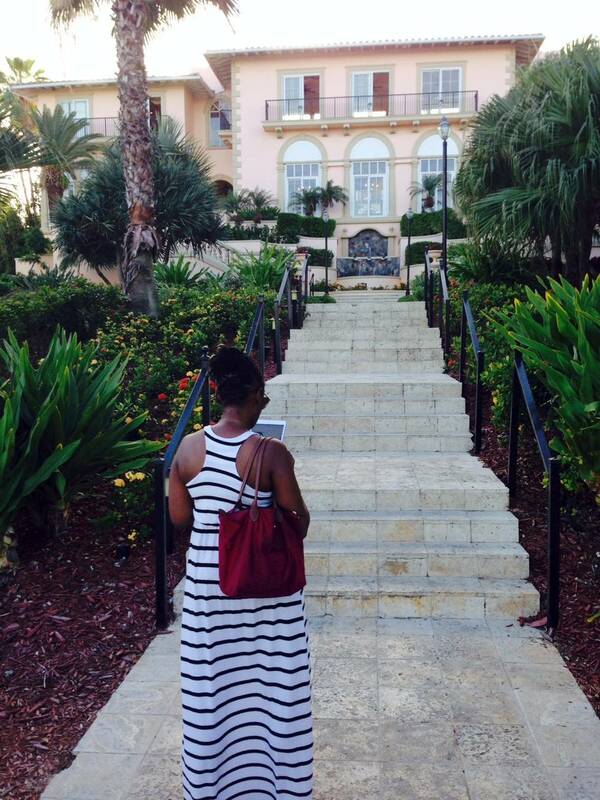 However, after sifting through tons of bad advice and toxic products, it is easy to feel lost or overwhelmed. That was me one year ago. I had tried the over the counter products. And prior to that, hydroquinon had been prescribed to me by my dermatologist. I found hydroquinon to be ineffective, and didn’t use it for very long. It was only after I discovered the world of green beauty that I learned of its toxic nature. Ultimately, having grown tired of experimenting with over the counter and prescription remedies, I stopped trying to even out my skin tone. That is until I was introduced to wonders of African Black Soap. In November 2015, Chime Edwards (HairCrush on YouTube) published a video titled Get Rid of Acne & Hyperpigmentation (Dark Spots). The before and after pictures in the first few seconds of the video immediately grabbed my full attention. Over the next five minutes Chime shares the four (4) toxin-free steps that she followed for approximately eight (8) months in order to rid her skin of acne and dark spots. One of those steps was washing her face with African Black Soap, also called black soap, dudu-osun, ose dudu or alta samina. 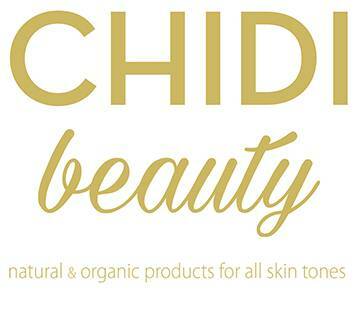 Seeing the transformation in Chime’s skin, achieved in part with such an easy, natural remedy, I immediately ran out and bought a bar of African Black Soap to try for myself. 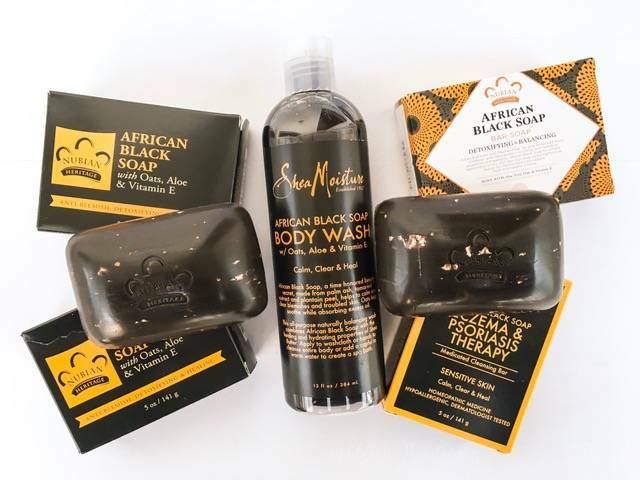 Originating in West Africa, black soap has traditionally been used as a remedy for a variety of skin ailments. From discoloration and acne, to eczema and rashes, this soap has been used to alleviate it all. It is said to be great for all skin types, including the most sensitive. Black soap can be used from hair to toe. 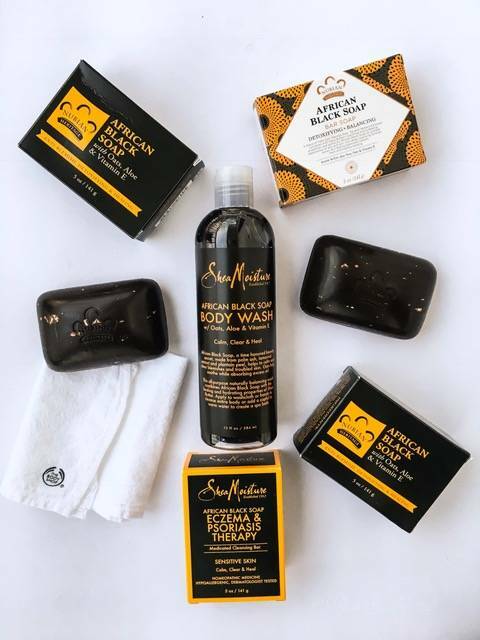 Originally made from ash, roasted plantain skins, which are a good source of vitamins A, E and iron, or roasted cocoa pods, palm kernel oil, coconut oil and shea or cocoa butter, black soap is known for its beneficial ingredients. Today black soap may also be made with palm ash, or ash from a number of plants and tree bark, sea salt, oats, aloe, honey, vitamin e, glycerine and other natural ingredients. Those ingredients contain antibacterial, skin renewing and skin restoring substances such as allatonin, antioxidants, lauric acid and essential fatty acids. The ash from the roasted plantain skins and cocoa pods replaces the need for conventional lye in the saponification process and gives the soap its black or brown color. The end result of the manufacturing process is a brownish-black bar of soap that is soft and malleable, and leaves your skin feeling the exact same way. Black soap is normally vegan, but as there are now so many varieties it is essential to read the ingredients of whichever brand you are considering buying. When it lathers, black soap produces white or greyish suds. It does not stain your skin or your tub. Unlike charcoal soap, there is no huge mess to clean up afterward. During the time I have been using it, black soap has noticeably helped clear my hyperpigmentation, and keep my acne and other skin conditions under control. However, black soap is not a magic cure for acne and hyperpigmentation. African Black Soap effectively disinfects, heals and restores the skin when used regularly and continuously. I use it to wash my face morning and night. I will let the lather from the soap sit on my face as long as possible, especially at night, when I allow the lather to dry before wetting my face and using my Fore Luna Mini to get an extra deep clean. There is one risk that you should be aware of before you begin using black soap: some brands may contain hard or sharp pieces that can scratch or cut your skin. 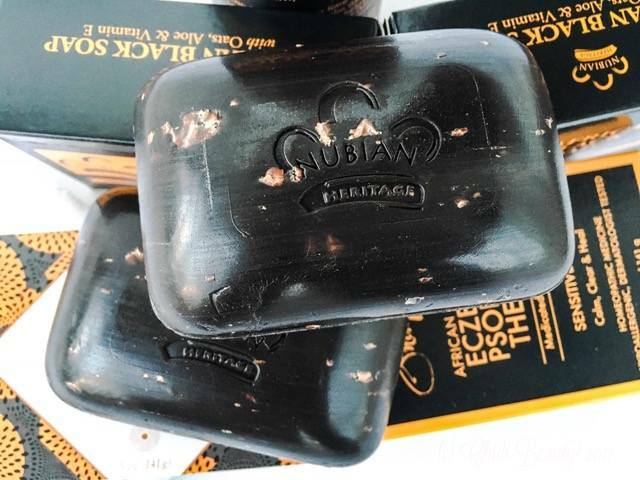 The more commercial brands of black soap, such as Shea Moisture and Nubian Heritage, tend to be flawlessly refined. I recommend sticking to those brands if you have small children or will be using the soap on small children or delicate areas of your body, such as your face. Other brands that make make an excellent black soap, such as Okay Pure Naturals, may contain hard or sharp pieces in their soap that can be a little dangerous. Either use these brands as a base to make liquid soap, which you can strain yourself, or be extremely cautions when using them and do not apply the bar of soap directly to your skin. Have you tried African Black Soap to clear your complexion? What is your favourite brand? What were your results? Let us know in the comments section below. Thanks for stopping by! I’m glad this encouraged you to learn more about black soap. I use the Akoma black soap brand from Ghana.It is mixed with coconut oil. It is very good. Lolo, thanks for recommending a new brand! I hope to be able to try it soon. Another excellent brand is Goddess Body. It is handcrafted in Ghana. Its worked absolute wonders for my cystic acne. Oooh! That sounds great! I am going to look up Goddess Body now. Thank you Kristi! I bought the Nubian soap and dudu-osun soap and I much prefer the finish and consistency of the Nubian soap. My sister has been using this soap over the past year and half and swears by it. She doesn’t have any hyperpigmentation. I did try the Nubian soap over few days to clear some of my hyperpigmentation and once I stopped it seemed that my hyperpigmentation reappeared. Are we supposed to wear a high SPF after wearing it? Would love to give it another go, I am just worried whether the hyperpigmentation will come back worse or not? Thanks for your comment Vani. I agree; the Nubian Heritage brand is more commercially appealing. But I find the Dudu Osun brand to be more effective. You raise an interesting point that I have not come across before; I have no information about whether African Black Soap makes Skin more susceptible to hyperpigmentation. That might be an interesting study for any scientist reading these comments. But you are correct: in general, wearing sun protection is a must for anyone who is treating hyperpigmentation. If we treat the discoloration thereby making our skin more vulnerable to harmful effects of the sun, and fail to protect our skin from the sun that is a recipe for disaster. I hope you give it another try. But this time give it a few weeks instead of a few days. Please come back and let us know your results! Glad you are also a fan of African Black Soap! I hope it works for you too Wendy! Remember to use sunscreen daily – there is no point fighting hyperpigmentation if you are not using sunscreen. What exactly do you use on your skin after washing your face with the soap ? There are two things I always try to do: (1) Use a toner a/k/a facial mist afterwards when cleansing my face with bar soap. (2) During the day wearing a good SPF has been essential. Those two things have helped me immensely. Good luck finding a skincare routine that best suits your needs. My body loves shea butter, but it makes my face break out. Plus I need something a little stronger since I live in the Caribbean. But I would be interested to hear from others who use shea butter for sun protection. Is it effective? How does it compare to zinc oxide sunblock? I just purchased the Nubian heretagr African black soap detoxifying and balancing. It my first time using it. Is it supposed to stain. I used a white wash cloth and it just seems like alot of color coming off this bar of soap. Make me wonder if this is normal? Is this film being left on my skin. I feel great after using on my body and face but just concerned about that film it left?